Coordonnateur : Raffa Robert B.
Opioids such as morphine, codeine, and oxycodone are extracts or analogs isolated from a single source: the opium poppy. For a long time, it was believed to be nature’s only source of opioids. But it now appears that biological diversity has evolved an alternative source of opioid compounds—those derived from the plant Mitragyna speciosa. This plant, known as Kratom in Thailand or Biak-Biak in Malaysia, has long been used locally as treatment for pain, fever reduction, diarrhea, and even depression. 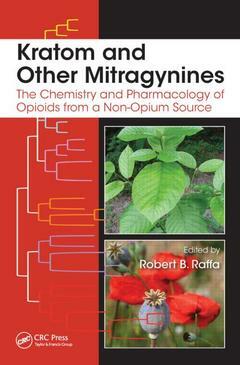 Kratom and Other Mitragynines: The Chemistry and Pharmacology of Opioids from a Non-Opium Source presents an introduction to the chemical and biological properties of alkaloids isolated from M. speciosa as well as their synthetic analogs. The book covers various topics including phytochemistry, medicinal chemistry, and pharmacology. Current research, analgesic effects, and addiction potential are also discussed. As the first extensive text on the basic science and clinical use of Kratom, the book provides readers with a concise yet comprehensive introduction to nature’s "other opioid." Why Do Plants Contain Biologically Active Compounds? Pharmacologists, medicinal chemists, pharmacists, drug abuse treatment specialists, psychologists, psychiatrists, pain management practitioners, treatment centers, regulatory agency personnel, health economists, HMOs, and pharmaceutical companies involved in pain products.